As I mentioned a while ago in my “State of the Wota Address” an idol I really really like, Aso Natsuko, decided to come to London, which is where I’m spending the current semester! So I immediately bought tickets to the convention, and embarked on my first idol live! It’s kind of hard to believe that even though I’m a really enthusiastic idol fan that I haven’t had the chance, but the past two days have more than made up for my lack. The event was at a convention/thing called Hyper Japan; now I hesitate to call it a convention because it really doesn’t do panels or things. It’s basically a room with a lot of vendors (basically like a regular convention’s dealer’s room, but with more things, actual food and actual high profile companies). Friday: I got there at about 3:30. Since I knew that the Nacchan live was at 7:30, I kept an eye on the stage and the seats there and wandered a bit. I ate takoyaki (my favorite food!) 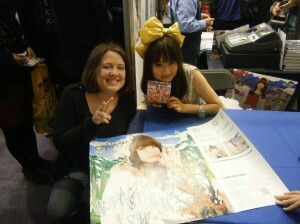 and went to the booth where they were selling Natsuko’s CDs and goods. I got some trading cards of hers. 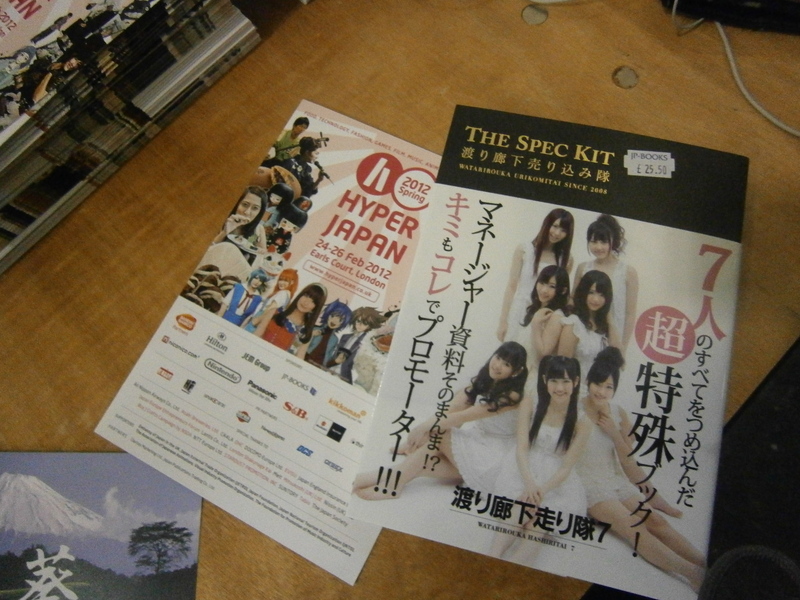 I was pleasantly surprised that they had a lot of AKB48 goods/photobooks as well! I was contemplating which one to get when I saw that the Watarirouka Hashiritai 7 spec book I’ve had my eye on was there. I had a small conversation with the guy who worked there about how I knew Nacchan, and he said she’d stopped by the shop after her rehearsal! He mentioned he didn’t know her before the convention, and seemed a bit surprised that I was legitimately into her before the con. Her most recent album, Precious Tone, was there on sale for 35 pounds. I was thinking about it, but decided against it, because that’s kind of a lot. It’s a better deal than her most recent single, Lovely Girls’ Anthem, though! 25 pounds for a regular edition single! I wandered around a bit and decided to sit down at the stage to watch a demonstration on wotagei…that ended up leaving me realizing I knew more about wotagei/wota culture than the people running it! It was kind of funny to see how they didn’t know what they were doing, but at the same time a bit sad. The one thing that puzzled me the most and keyed me in that the people running it didn’t really know what they were doing was that the final thing was done to K-On! music. Now, I love K-On!. For any of you who know it, I actually own a Tsumugi figure. It’s great. However, it’s not the choice I would have made…at all. I feel like it would have been better to choose a more standard wotagei choice, such as the quintessential wotagei song, Fujimoto Miki’s Romantic Ukare Mode. (Mikisama Mikisama oshio ki kibun nu!). Or do some of the AKB48 MIX, since AKB’s so popular. I also found a travel brochure that had a map made by Mitsui Aika. No joke. She made a map of Shibuya that’s in a travel booklet. I decided to stay and keep my seat (or gradually move closer to being front and center), which was a good idea, because multiple people came to the wotagei, decided to stay for the shamisen performance and stay for Nacchan’s performance. A couple were wota who seemed to come from Japan to see Nacchan; at first I was kind of excited, and wanted to talk to them about stuff (like, if they liked other idols, things like that). However, they were standoffish at best, definitely in their own world doing wotagei and whatnot. 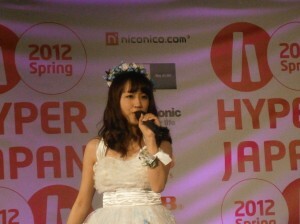 Finally,when Nacchan performed, it was honestly better than I could have dreamed. I liked her a lot in PVs, and her singing voice is particularly good (she sang completely live at this con and was completely amazing.) However, just the level of energy she had was mindblowing. She was energetic, really adorable (especially when speaking in English), and just overall better live than in any PV or any song. Just amazing stuff. Her singing was, as I said, all live and really good; about halfway through her voice started to give out, and I think that’s partially because she flew in earlier that day. But she was a trooper and kept up the good performance to the end! Friday’s performance was a 50-60 minute live and chat, so the host asked her a couple of questions about things like how she can manage studying and being a singer/TV host. A lot of the questions were a bit boring, and the translator was definitely not the best (though, it was kind of funny when Nacchan understood one of the questions in English and basically went “I got this” and answered). I’m lucky that I understand some Japanese, and got her full meaning! She sang a lot of her songs ,some I knew but others I didn’t know as well. But it was fun to shout at the songs I know, specifically Perfect Area Complete and Diamond Star. At the end of the concert there was a small rock-paper-scissors contest with the audience and Nacchan to win some autographed mugs. I sadly didn’t win one, and was kind of jealous of the audience members who did; I also think that only the Japanese wota and I realized how lucky the fans were because they all got to shake her hand! Especially since that’s an event you normally have to buy things to get into! But man, that event was so amazing. As I’ve mentioned on Happy Disco before, I think idols are really great in how they can bring up your mood and just make you happier. 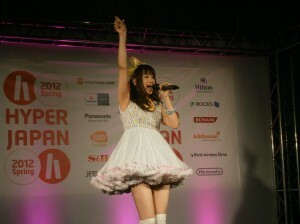 And while that’s still the case, it’s just amazing how much that’s amplified by seeing idols you like IN PERSON. The whole concert had a ton of energy and was ridiculously fun. And then I went and spent a lot of money and bought her album, Precious Tone. Which is the other major point of being an idol fan, which is that your money is totally vulnerable to them. But it worked out great because it came with a big poster, a poster I would have spent money on buying alone. So that was good! 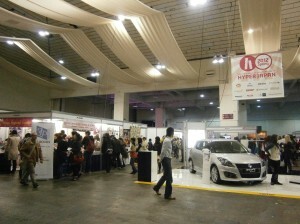 Saturday, I woke up a bit late and hurried to get to the event. Luckily (??) there was a massive line to get in, so I didn’t miss anything. I walked around a bit moe, but then ended up waiting for the event. This one was a bit shorter, but actually had a lot of great songs, and no weirdly awkward talk moments. Some of the songs played on Saturday (honestly, Friday’s live is a bit more of a blur): Lovely Girls’ Anthem, Programming for Non-Fiction, Eureka Baby, Diamond Star, Perfect Area Complete, and, at the host’s request, a spontaneous performance of one of my favorite songs by her, More More Lovers!! Saturday’s performance was just as energetic, even better vocals, and she was still amazing. I knew that an hour after her live performance ended she was going to be doing a signing so I went and hung around that booth until I realized she was there (missed her coming in, was too busy looking at AKB48 stuff, whoops!) and that the line was already massive. I got in line and was anxiously trying to remember Japanese. I had a few things I really wanted to say…which I didn’t remember. When I got to the front of the line I was SO starstruck that I only managed to get out “the concert today was very fun” and to thank her profusely. She seemed really happy, though, and smiled while I got out what I wanted to say in Japanese. She thanked me multiple times as she signed my items (the Precious Tone album booklet and the poster), and asked me to come see her again, both in Japanese and in English (“See you next time! Come see me again!”) I know she says that to a lot of people, but when she said it to me it seemed so earnest that I kind of wonder if she noticed me in the concerts, since I was way up front for both of them. Even still, I hope I’ll get a chance to see Nacchan again! Even though I had fun at the concert, the biggest surprise came in the autograph line, when a few people in front of me asked to get a picture with Nacchan. I was surprised that it was allowed, because I know that two-shots are actually fairly rare in Japan and then are usually two shot events. Once I saw this I whipped out my camera and asked the staff for a picture, too, and so…. All in all, best experience ever. Ahh, the thirty day idol challenge. I’m going to credit this with whipping me back into shape as a blogger, because while I like idols I think I was kind of stuck when it comes to content when I kind of stopped blogging earlier. Now it’s the last question, and the biggest doozy of them all. Day 30: Why do you love Idols? This is a tough question, because i have this big urge to go off and ramble about why I think idols are amazing. The real answer is basically everything. I love everything I’ve found about idols, and it’d honestly be tough to find a thing I didn’t like about them. The reason I spend my energy following JPop idols and not, say, western music (though I do follow western music, just not pop music) is because it’s really different from popular music in the US. I love my indie/alternative rock, but popular Western music really doesn’t do all that much for me (with the exception of Katy Perry, but shuushh). I love idol MUSIC because it’s positive and upbeat. Even the serious songs like AKB48’s Beginner usually have a good message (though not always) and it’s never about the club. I want to rid the world of songs about the club. Idol music itself is fun and happy, something that I often find seriously lacking in western music, and so I appreciate idols for that. That’s one of the big things I love about idols; is that watching their antics just makes me feel a lot better, no matter what. favorite idols performing on stage doing their best or doing something silly on a show. So basically, above all else, I love the fun and happiness of idols; there’s a reason this blog is happy disco.